COLLEGE PARK, Md. — Those dancing shoes are back on for the Terps. The Terps learned of their NCAA Tournament matchup on Monday during the NCAA Tournament selection show. It was a broadcast event pushed up two hours after the bracket was leaked on ESPN. Players and coaches rushed from the practice floor into the locker room to catch the 5:00 p.m. show. They are scouting as the No. 3 seed in the Albany Region. The Terps are a host site for the first two rounds of the 64 team tourney. Maryland (28-4) will take on No. 14 seed on (26-6) Radford on Saturday at 11am. “We’ve earned the right to play at home, in front of our tremendous fans. So, we’re prepared. We’re ready,” added Frese. The Terps are ranked ninth in the country. They won the Big Ten Conference regular season championship but were upset by Iowa in the Big Ten Tournament title game. While this whole NCAA Tournament thing is old hat for the Terps, advancing to their ninth straight big dance, that is far from the case for Towson. The Tigers, fresh off their first Colonial Athletic Association tournament championship, are headed to the NCAA tourney for the first time in program history. “It’s a great feeling. The team is pretty pumped up. 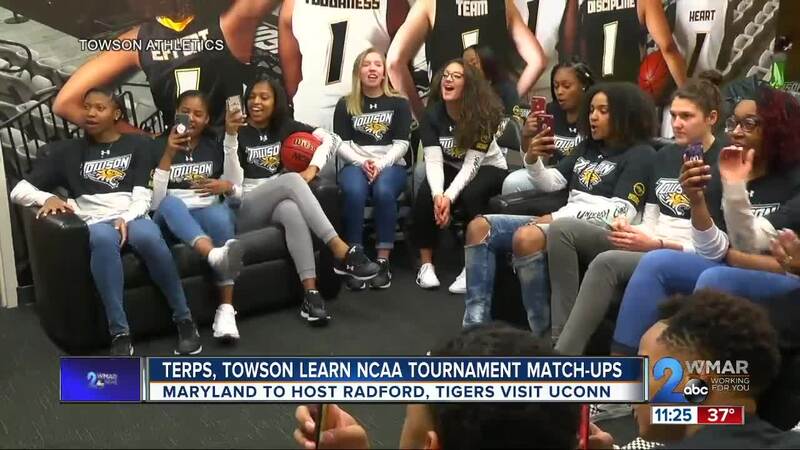 People kind of counted us out,” said Towson Head Coach Diane Richardson. Towson (20-12) is the No. 15 seed in the Albany Region. They head to Connecticut to play host UConn (31-2) on Friday night at 6:30 p.m. The Huskies, a legendary program and perennial national championship contender, are a No. 2 seed for the first time since 2006. The Tigers are drawing on some cross-county inspiration for the contest. “We could be the next UMBC. Nothing is impossible,” said Towson guard Q. Murray. The UMBC men's basketball team became the first No. 16 seed to defeat a No. 1 seed in the men's NCAA Tournament last year. The Retrievers knocked off Virginia. “They put on their shoes the same way we do. They bleed the way we do. We shouldn’t let any name on their jersey intimidate us," Murray said about UConn. "We’ve just got to go out and pay hard." And try to make a little more history.